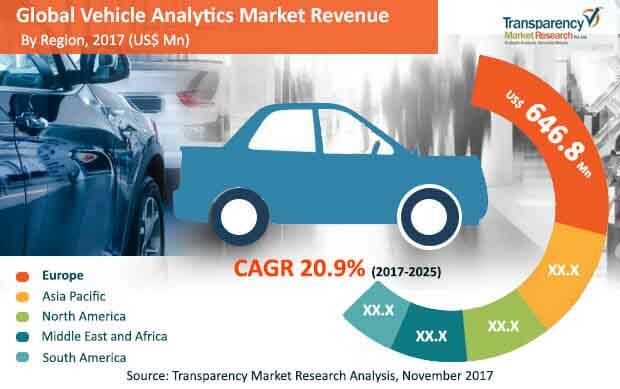 The global vehicle analytics market is forecasted to showcase a stellar growth in the coming years, according to Transparency Market Research (TMR). The report states that the vendor landscape is characterized with rising competitiveness between industry players. The vendors are expected to focus on acquisitions, partnerships and collaborations, to expand their geographical outreach as well as enhance their product portfolio. A number of vendors are increasingly investing in upgrading their existing products in order to beat the competition. Some of the leading vendors in the global vehicle analytics market are Harman International Industries, Amodo, INRIX, Automotive Rentals, Inc., and SAS Institute Inc. According to TMR’s report, the global vehicle analytics market was roughly evaluated to be US$ 646.8 mn in 2017. With an outstanding 20.9% CAGR, the vehicle analytics market is prognosticated to rise to US$10,215.5 mn over 2017 and 2022, the forecast period. Segmented on the basis of end-user, the segment of tier 1 suppliers is predicted to emerge as the leading share holder of the global vehicle analytics market. The rise of the end-user segment could be ascribed to the pivotal role played by software and hardware suppliers to other industries. Geographically, the market is prognosticated to witness the dominance of Europe, owing to the large presence of automotive manufacturers in the region, particularly in Germany and the U.K. The region is expected to hold over one-third of the global vehicle analytics market, attributed to the swift adoption of car analytics solutions as well as electric vehicles. The region is also favored due to encouraging government and regulatory policies. The significance of vehicle analytics is likely to be realized with the mounting need for automation, fleet and mobility management. Manufacturers are increasingly integrating advanced vehicular technology in their products, thus enabling transport service providers to enhance operational efficiency, and provide improved customer service while offering sustainability. Vehicle analytics empowers advanced analytics and helps in managing and streamlining different operational procedures. The focus of manufacturers is slowly shifting towards inclusion of artificial intelligence, machine learning, and predictive analysis in vehicles, making them even more tech-savvy. The coming years are expected to be a host to all kinds of cloud services and platforms, and the automotive industry is also slated to witness the proliferation of cloud and related services in the coming years. Cloud connectivity promises better route mapping, traffic management, and effective transport parameters. The automotive industry is likely to benefit from the introduction of cloud technology with more streamlined processes, lowered accidental situations, real time tracking, traffic and predictive analytics, turning the need for safe, pragmatic autonomous vehicles a reality. This is a significant factor fuelling the growth of the global vehicle analytics market. While there are some challenges plaguing the industry, such as network coverage and interoperability issues, and high capital investment in the sector, the rapidly rising adoption of advanced vehicular technologies will help overcome the these hindrances and promote the global vehicle analytics market.